It didn’t make many national headlines, but the proposed budget for NASA’s “Planetary Defense Coordination Office” was just increased by 90 million dollars. At a time when our national budget is already stretched to the max, this seems like an odd thing to be spending so much money on. As you will see below, the “Planetary Defense Coordination Office” is only two years old, and it is in charge of tracking threats posed by near-Earth objects such as asteroids. Needless to say, if a giant asteroid suddenly hit our planet it would be the greatest catastrophe in modern times and for those of us that survived our lives would be radically different from then on. So the threat is real, but in recent years NASA has assured the public that there are no imminent threats. Has that now changed? The Trump administration has proposed increasing the budget for NASA’s Planetary Defense Coordination Office by three-fold — from some $60 million to $150 million — amid growing concerns that humanity is utterly unprepared for the unlikely but still unthinkable: an asteroid strike of calamitous proportions. The White House also recently issued a new National Near-Earth Object Preparedness Strategy and Action Plan intended to energize a host of agencies who could contribute to potential ways to prevent such as a disaster. First of all, why spend 90 million dollars that we don’t have if there is nothing to be concerned about? Secondly, why issue a brand new plan that is “intended to energize a host of agencies who could contribute to potential ways to prevent such as a disaster” if there is no disaster looming for the foreseeable future? Something doesn’t smell right about all of this. According to NASA, there are more than 25,000 asteroids lurking out there that are 140 meters in size or greater. And overall, there are approximately a million near-Earth objects that could pose a potential threat. If and when the interplanetary asteroid apocalypse comes, NASA plans to be prepared. The office is also developing long-term planetary defense goals. They include “asteroid redirect” concepts that could could push the threatening object off course and away from Earth – a program also of interest to the European Space Agency. NASA is poised for the worst case scenario as well. “Even if intervention is not possible, NASA would provide expert input to FEMA about impact timing, location, and effects to inform emergency response operations. In turn, FEMA would handle the preparations and response planning related to the consequences of atmospheric entry or impact to U.S. communities,” the space agency noted. As we studied the problem more, we looked at the effects of an impact of even a 100-plus meter size object. If it were to impact near a metropolitan area, it would be a disaster on a scale more than anything we’ve tried to deal with in our history. So the threshold that we wanted to look for these things was lowered actually to 140 meters in size based upon a study that NASA sponsored. It would be an existential threat to national well-being. The effects of it would have a significant impact to our society and a nation as a whole. But once again, why all the fuss if NASA is confident that there are no major threats on the horizon? Or could it be possible that they are not being entirely truthful with us? 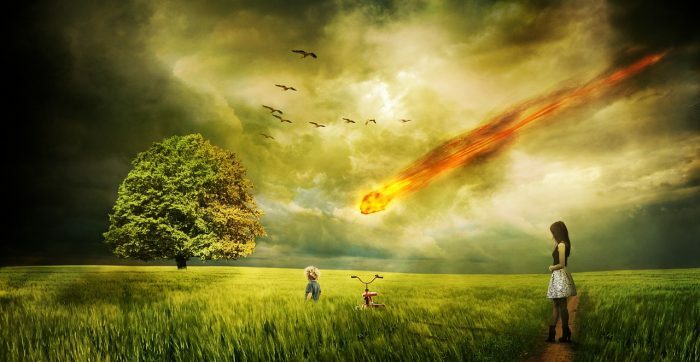 In a previous article, I discussed the fact that the head of Russia’s space agency, Anatoly Perminov, has publicly stated that an 885-foot-wide asteroid known as Apophis “will surely collide with the Earth in the 2030s”. The 2030s may seem like the distant future right now, but to me it seems like it was just yesterday that the calendar was rolling over from the year 1999 to the year 2000. And of course there are so many threats that the major space agencies don’t even know about at this point. For example, the huge meteor that recently exploded over a U.S. military base in Greenland was a complete surprise to authorities. The truth is that the next time we get hit, there will probably be little to no warning, and if the asteroid is big enough millions of people could die. If an asteroid crashes into the Earth, it is likely to splash down somewhere in the oceans that cover 70 percent of the planet’s surface. Huge tsunami waves, spreading out from the impact site like the ripples from a rock tossed into a pond, would inundate heavily populated coastal areas. A computer simulation of an asteroid impact tsunami developed by scientists at the University of California, Santa Cruz, shows waves as high as 400 feet sweeping onto the Atlantic Coast of the United States. We are talking about a disaster that would wipe out Miami, Charleston, Washington D.C., Baltimore, Philadelphia, Boston and New York City along with countless other cities in a single day. Today, 39 percent of all Americans live in a county that directly borders a shoreline, and so we are extremely vulnerable. And scientists assure us that it is only a matter of time before we see more giant tsunamis like the one that devastated Japan in 2011. Even if no asteroid hits us in the near future, the crust of our planet is becoming increasingly unstable, and this is particularly true along the Ring of Fire. Part of the job of the federal government is to protect us, and so NASA should be applauded for wanting to be prepared. But are they being entirely truthful with us, and if not, what is it that they are not telling us? Next articleThe Real Elizabeth Warren?